Measles Cases Spike Driven By Outbreaks In N.Y. And 4 Other Regions : Shots - Health News This year, the U.S. has confirmed 550 measles cases so far. A recent spike is connected to outbreaks in New York, but there are outbreaks in four other states too. 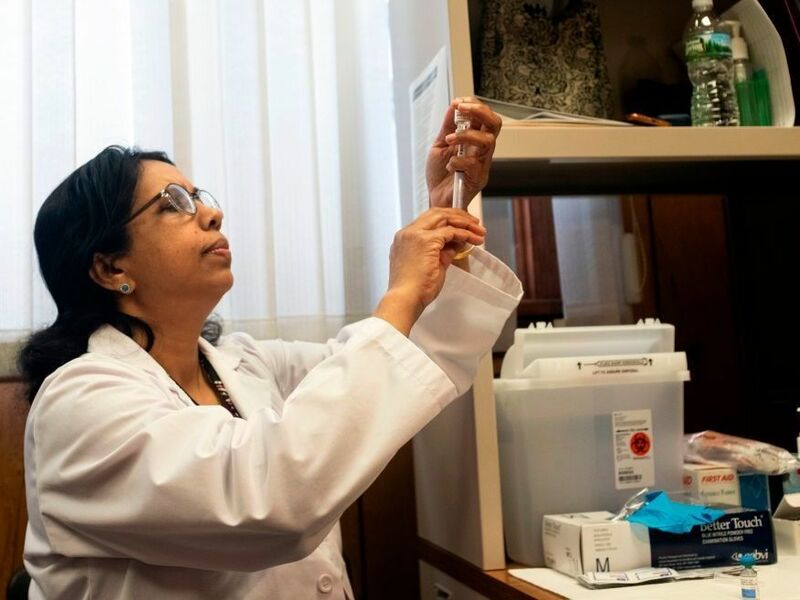 A nurse prepares the measles, mumps and rubella vaccine at the Rockland County Health Department in Haverstraw, N.Y. Several measles outbreaks in New York state are contributing to this year's unusually high measles rates. Measles is surging. Last week the U.S. recorded 90 cases, making this year's outbreak the second largest in more than two decades. So far this year, the U.S. has confirmed 555 measles cases, the Centers for Disease Control and Prevention announced Monday. That's 50 percent higher than the total number recorded last year, even though we're only about a quarter of the way through 2019. And the virus isn't slowing down. "The number of cases is accelerating," says Dr. Amanda Cohn, a senior adviser for vaccines at the CDC. "We are on track to have one of the highest numbers of cases of measles reported since we eliminated the disease in the year 2000." The majority of the cases are connected to outbreaks in New York, Cohn says. "This is a very significant outbreak," she says. "These cases were imported from other countries, but because of low vaccination coverage in these communities, measles is spreading widely throughout these communities." Last week, New York City declared a public health emergency in an ultra-Orthodox community in the Williamsburg neighborhood of Brooklyn. The city's Health Department is mandating that parents vaccinate their children, or they may face a $1,000 fine. The CDC pointed to four other places with ongoing outbreaks in the U.S.: Clark County, Wash.; Oakland County, Mich.; two counties in New Jersey; and a handful of counties across California. Health officials say there are two main reasons for the virus's surge: more international travel and lower vaccination rates. Several countries around the world are currently experiencing massive measles outbreaks. Madagascar has recorded more than 100,000 cases since the fall, with more than 1,200 deaths. Ukraine has recorded about 37,000 cases this year. And the European Union is tallying about 1,000 cases a month. Globally, the World Health Organization reports that measles cases in the first quarter of 2019 nearly quadrupled compared with what was reported at this time last year. More American families are bringing measles home with them after traveling abroad, Cohn says. And once the disease lands stateside, it has a better chance of gaining a foothold because vaccination rates in some places have dropped below 93 to 95 percent, the threshold required to protect the entire community. "When you make the decision not to vaccinate your child, please understand you're also making that decision for the people around your child," New York City's deputy mayor of health and human services, Herminia Palacio, told NPR on Wednesday. Measles can be an extremely serious disease. About 25 percent of infected children are hospitalized. About 10 percent of children develop ear infections, which can cause permanent hearing damage. In about 1 in 1,000 cases, the infection becomes life-threatening. In these cases, the virus moves to the brain, causing encephalitis and convulsions. Children can be left deaf, blind or with intellectual disabilities — if they recover. Before the development of the measles vaccine in the 1960s, the U.S. recorded nearly a half-million cases each year, the CDC says. About 48,000 kids were hospitalized and about 500 people died per year. "We eliminated measles from this country in 2000, and ... I think we eliminated the memory of that virus," Dr. Paul Offit of Children's Hospital of Philadelphia told NPR's Weekend Edition Sunday. "People don't remember how sick it could make you."